You are here: Home > Search for "CarPro"
This kit provides enough sealant to give 2 medium size cars 2 coats each! The CarPro Large Ceramic Paint Protection Kit includes: 50 ml. CarPro Cquartz, CarPro Cquartz applicator, 5 Suede Microfiber Cloths, 500 ml. Reload Spray Sealant, 500 ml. Iron X, and 3 Microfiber Detailing Towels (16 x 16 inches). Appearance may vary from photo. The CarPro Microfiber Suede Cloths are great for applying the CarPro cQuartz, along with any other coating! This cloth is extremely soft and smooth because it's a special suede material, intended to apply automotive coatings smoothly. They feature no edges or hems, which keeps this towel ultra thin and flat. 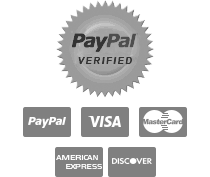 This allows you to apply coatings like CarPro products expertly and smoothly. These cloths are very thin and uniform, improving your application results! This material is ultra gentle on all surfaces, so you can also use these cloths on navigation screens, interior plastics, TV's, and monitors, glasses, mirrors, etc. You can also use them on motorcycle helmet visors. Order an extra pack and never be short of these handy cloths! 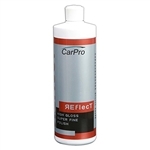 Developed to compliment the CQuartz line of nanotechnology coatings, CarPro Reflect is one of the most advanced finishing polishes on the market. With a proprietary blend of fine quick diminishing abrasives and sophisticated nano-technology, Reflect quickly removes holograms and light wash marring, revealing a superb glossy finish. Tested in the real world by pro detailers, Reflect has all the features that both hobbyists and pros desire: easy and fast to use, zero filling or masking of defects, consistent results on both hard and soft paint types, and a highly reflective mirror-like appearance. Welcome to the future of paintwork finishing technology: Reflect! Silicone and wax free formula means Reflect is 100% Body Shop Safe, which along with low product consumption (1/2 oz per car) make it suitable for use in a high-volume refinish environment.